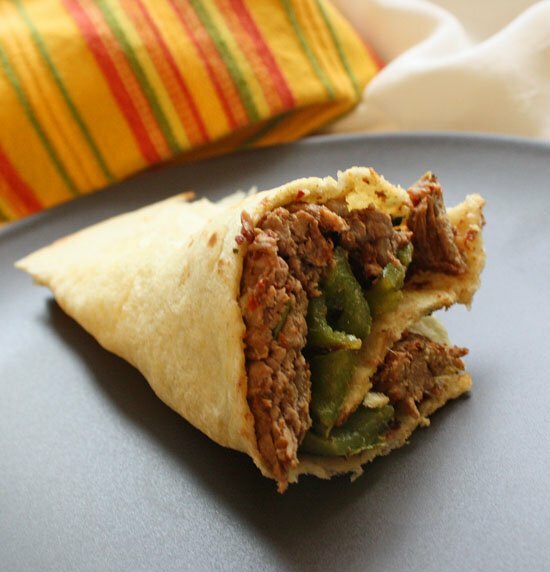 Have you ever grilled thin slices of Mexican-seasoned beef, alongside whole jalapeno peppers (tops trimmed for serving) and rolled them up in a warm fresh flour tortilla? If not, you don’t know what you’re missing. This is a trick I learned from our next door neighbor Miguel. The gringo in me sliced open the grilled jalapeno and scraped out the seeds and veins, but other than that, the whole process was quick and easy and within a few minutes we were standing next to the grill with rolled carne asada tortillas in our hands, just like were were enjoying street food in Mexico. I’m lucky to have three nearby markets who sell pre-seasoned Carne Asada. Which makes it a super easy thing to pick up for a quick weeknight meal. One offers flank steak, one skirt steak and the other flap steak. I prefer the skirt or flap, nice and thin. Each of them also season the meat a little differently, and it’s all wonderful. In the American markets it’s labeled carne asada, and at our Mexican market it’s labeled carnicerías. The photo above is prepared with flank steak (closest market to home), thin sliced against the grain after grilled. I’ve also discovered a great little bottle of spice mix called, Don Sazon Meat Seasoning. A quick marinade for about 30 minutes with some of this dry spice and orange juice and you’ve got a great seasoned piece of meat to throw on the grill for Carne Asada. If you’re looking to be pure and want a recipe for Authentic Carne Asada, this recipe from the site Mexico In My Kitchen is the only way to go. This is even better if you purchase fresh made flour tortillas from your local Mexican Market. Can you spell d-i-v-i-n-e? Switching gears for a moment, pull up a chair for some short term barking. I’d like to introduce you to Ruby. Ruby is the first dog to appear in my new feature, Paws on the Ranch…Every Paw…Has a Story. I’ll be posting photos of the pups I run across here in Highlands Ranch. That is, those who agree to pose for a photo. You see, I have this huge soft spot in my heart for our furry friends. I hope you enjoy meeting some of my neighbors. What’s my story? My mother was pregnant with us and lived in the 9th Ward. She was saved from the flood waters and evacuated to a Colorado shelter where I was born shortly thereafter. We are Katrina rescues. Not a bad story for my first encounter. I was a little reluctant to ask a total stranger if I could photograph her dog, but when I explained my plan, all parties, including Ruby were very cooperative. Note to self: strong shadows at 6:30 a.m. Hopefully my canine photography will improve in time just as I hope my food photography has. I’ll take anything wrapped up in any type of tortilla. As long as I remove seeds and veins, I’m ok with the flavor of jalapenos. I’m not sure how roasting affects heat. That’s a very good thing to research. Oh….and lovely story about Ruby! They look delicious LA – Bev bought this jalapeno corer – http://www.norprowebstore.com/fruit-vegetable/norpro-grip-ez-jalapeno-pepper-corer-121-271.aspx – recently and I used it to make some ABT’s last week. I had my doubts but was surprised at how well it worked at removing everything but a little at the bottom. It allowed keeping the peppers in tact and did as good as a knife after splitting them. It was also easy to use and well worth the $6 or $7 she paid for it. As always – the dish looks great! And I love that you are branching out on the blog to include canine friends. Now you have food, birds and dogs…doesn’t get better than that! Love the new feature! Ruby is very pretty, and awesome that she is a Katrina rescue! That’s awesome her mom was rescued, and the puppies survived! mmmm carne asada… I can smell it over here! Yum! Thanks Jane. I couldn’t believe my ears when I asked about her and this story was revealed. She’s a sweetie. I’ve seen her twice now since I’ve taken the photo. great new feature!! love the pic! love,love carne asada. Thanks Vianney. And I’m sure you know your Carne Asada. I have a jalapeno corer, too, and it works great. Delicious, delicious, delicious! Hi Ruby! HAVE to get one of those things. You are not alone, I scrape out the seeds too. This looks delicious and Ruby is adorable. I’m going to get me one of those core tools. I love your new feature! I have a soft spot for animals too! Love making carne asada.. we have a great Mexican grocery that sells it perfectly seasoned too… and LOVE grilled whole jalapenos.. I could eat them all by themselves! Great new segment on here too.. can’t wait to see more puppies you find! I can find all kinds of puppies, it just if they’ll let me and if I can get a good photo. I was very impressed with that first image. I was thinking you were pretty brave to have four peppers in one taco. Then I read you took the seeds out. The marinades flank steaks are a nice convenience and we use them too. I have been creating my own marinade and prefer it now. Hi Ruby. So two peppers deseeded doesn’t impress? 🙂 Have you blogged about your Carne Asada recipe? I love carne asada and nice to meet you Ruby, what a pretty dog. She’s a lucky dog. Thanks Ben. I adore the simplicity of this dish! I’m afraid I’d have to gringo out also and ditch the seeds 😉 Ruby is adorable, I love the furry friends too. I never had either until Miguel popped over the fence and handed me this wonderful rolled flour tortilla. I’m going to have to get him and his wife Rosa over to teach me some REAL Mexican cooking. Holy Cow, Lea Ann!!! You are a better woman than I am if you can eat all those jalapenos in your taco (even without the seeds). It makes me perspire just to think about it. Looking forward to meeting the pups in your neighborhood. Only two Cathy. I’m a gringo. I’d be scraping and seeding like that too, but just because I’m a wimp;) This sounds fabulous, Lea Ann. At least we admit it. Yum!! I love the idea of grilling Jalapeno’s and I will have to try them….possibly tonight! I also love your new feature and the fact that you are donating to the Max Fund. They are a wonderful shelter and took in quite a few animals from Katrina. I’ve been a supporter of Max Fund for years. Thanks for the comment.